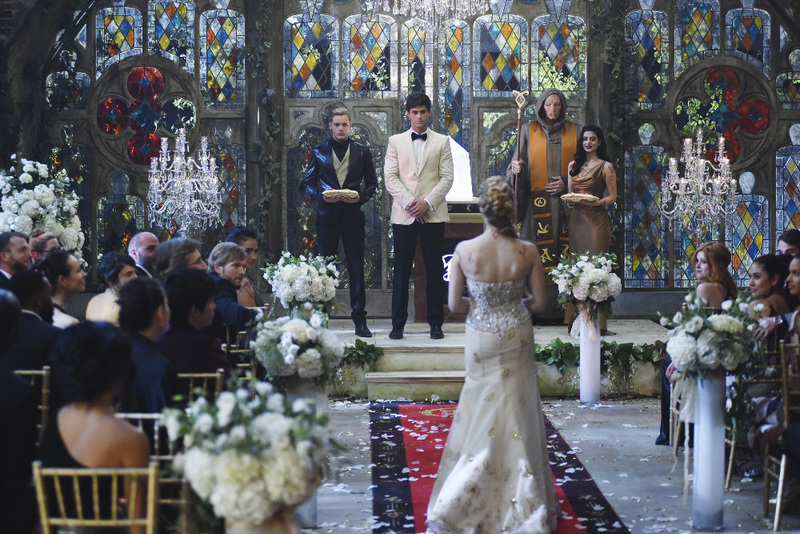 Freeform has released a sneak peek from Tuesday’s all-new episode of Shadowhunters, titled “Malec,” that features Lydia walking down the aisle to marry Alec. But just before they’re about to draw the wedded union rune on one another a certain glittery somebody has come to object. Be still our hearts! For an episode titled “Malec” this is already bringing the intense Malec feels! I hope this leads to where I think it does. I’m screaming! I’m so excited! I just love how much more foreward, how adult they are portraying the relationship of Malec. And I love how Magnus is fighting for this love that never really started. Harry Shum Jr. is amazing as Magnus. One can simply believe he just jumped out of one of Cassie’s books. He has sass, emotion and just gives the right feels about all of this. I might not be too happy with the special effects they used (ex: when he fortified the Institute), but he makes magic look superbe nonetheless. Alec is a whole other story, however. I believe him to be Alec Lightwood, son of the leaders of the New York Institute, older brother and calmer parabatai to an overwhelming Jace. I believe that he cares about Jace and Isabelle and I believe that he thinks he makes the right choice in marrying Lydia. I even believe that in the very bitter end, he would screw laws and such to save Isabelle and Jace. I also believe that he is hesitant about doing so. Matthew has done a great deal to make this Alec come to life. But: he behaves too confidently around Magnus. Too sure about what he wants. Not hesitant at all, no, more like his version in “World Inverted”. I like that, too, but at the same time I don’t really understand Magnus anymore. Alec’s characterization is not consistent, as many of you remarked in the review to episode 11. He should be shy towards Magnus as living his inclination towards men is something he dreads because of the Clave, because of his parents. I know today it’s not that huge a deal anymore with many states legalizing gay marriage, but it was still a deal when Cassie wrote the books. We were all enthralled by her portrayal of the two and Alec discovering that there was nothing wrong with loving the person he craved. I… I just don’t believe the fear of disappointing anyone by chosing Magnus over any woman is there in the eyes of Matthew’s Alec. I don’t see it and I don’t feel it. Oh well: I’m just majorly exited for this episode 12!!!! Malec for the win! OH MY GOD! That is the most exciting sneak peek! The looks of angst between Clary and Jace and then Magnus’s arrival, he definitely put Maryse in her place! I’ll have to wait until Wednesday to watch it on Netflix, it’s too far away!! Fight for your man, Magnus!